Curl the top eyelashes with an eyelash curler. Crimp them at the base of the eyelashes. Release. Move up higher toward the middle and crimp again. Release. Then again move up toward the tips and crimp again. Release. My young model had pretty straight lashes so I had to crimp them a few times. Put concealer over any dark areas under the eyes and on the skin towards the nose. Cover the skin with foundation and powder as desired. Decide on color location – start with pink on the outside of the eye or put pink on the inside of the eye. Put green mascara above and under the TOP lashes on only ¼ of the lashes towards the inside of the eye. Then also put it on the BOTTOM lashes on only ¼ of the lashes towards the inside of the eye. I was more focused on getting the color on rather than using the brush to brush it on. Many times I used the applicator tip because it’s such a small area of lashes. Carefully separate the lashes that may have clumped together with a toothpick. Fan them to let them dry. Repeat with another coat on the top and bottom. Separate any lashes that have clumped together. Let them dry. Remove any unwanted flecks that have gotten on the skin by wetting a cotton swab and wiping them off. 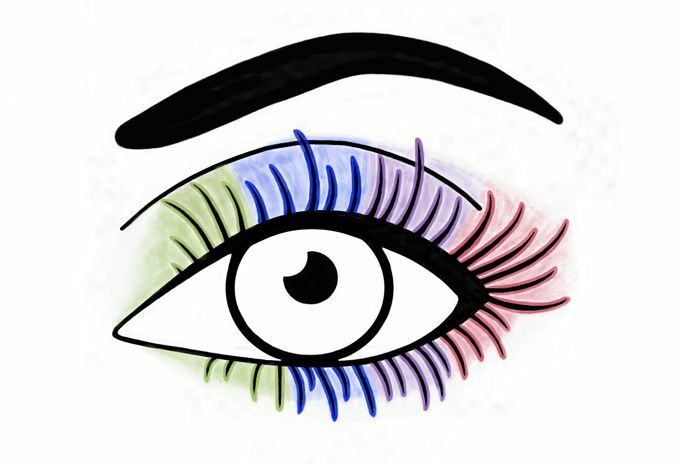 Use blue mascara to coat the lashes next to the green lashes covering ¼ of the lashes on both the top and bottom. Overlap on the green a little. Use purple mascara to coat the lashes next to the blue lashes covering ¼ of the lashes on both the top and bottom. Overlap on the blue a little. Use pink mascara to coat the lashes next to the purple lashes on the outside of the eye covering ¼ of the lashes on both the top and bottom. Overlap on the purple a little. Remove any stray flecks that got on the skin with a wet cotton swab. You may need to reapply concealer, foundation and powder if necessary. Apply the green eyeshadow to ¼ of the eyelid near the inside of the eyelid. It will take several coats to get it as dark as you need. Also apply it under ¼ of the lower eyelashes near the inside of the eye. Apply the blue eyeshadow to ¼ of the eyelid next to the green eyeshadow. Overlap a little. Also apply it under the lower lashes like above. Apply the purple eyeshadow to ¼ of the eyelid next to the blue eyeshadow. Overlap a little. Also apply it under the lower lashes like above. Apply the pink eyeshadow to ¼ of the eyelid next to the purple eyeshadow. Overlap a little. Also apply it under the lower lashes like above. Now go back and make sure you have all of the colors as dark as you need them or add more coats.